Pomona is the seventh largest city in Los Angeles County, California. Pomona is located in between the Inland Empire and the San Gabriel Valley. As of the 2010 census, the city population was 149,058. The city is the site of the Fairplex, which hosts the L.A. County Fair and the NHRA Auto Club Raceway at Pomona, (formerly known as Pomona Raceway) Powerade Winternationals Drag Racing competition. The city also hosts the Pomona Swap Meet and Classic Car Show is considered by many to be a Southern California classic. It is one of seven major events hosted at the Fairplex each year. It’s also home of Cal Poly Pomona, a polytechnic university in the city’s western edge. Since the 1980s, Pomona’s newest neighborhood Phillips Ranch, experienced rapid growth with homes still being built in the hilly area between Downtown and Diamond Bar. Today, Phillips Ranch is nearly all residential. Northern Pomona has seen some gentrification with additional housing units added and revamped streetscapes. The area was originally occupied by the Tongva or Gabrielino Native Americans. The city is named for Pomona, the ancient Roman goddess of fruit. For Horticulturist, Solomon Gates, “Pomona” was the winning entry in a contest to name the city in 1875, before anyone had ever planted a fruit tree. The city was first settled by Ricardo Vejar and Ygnacio Palomares in the 1830s, when California and much of the now-American Southwest were part of Mexico. The first Anglo-Americans arrived in prior to 1848 when the signing of the Treaty of Guadalupe Hidalgo resulted in California becoming part of the United States. By the 1880s, the arrival of railroads and Coachella Valley water had made it the western anchor of the citrus-growing region. Pomona was officially incorporated on January 6, 1888. Religious institutions are deeply embedded in the history of Pomona. There are now more than 120 churches, representing most religions in today’s society. The historical architecture of these churches provide glimpses of the European church design and architecture from other eras. In 2005, Pomona citizens elected Norma Torres, the first woman of Guatemalan heritage to be elected to a mayoral post outside of Guatemala. Most of Pomona and some of the surrounding area are served by the Pomona Unified School District. The Claremont Unified School District is zoned for the students in the northern section of the city. The Pomona School District has been criticized by some Pomona residents for its construction of the acclaimed expressionist modern Diamond Ranch High School in the city’s more affluent area of Phillips Ranch. There are two parochial schools located in Pomona: St. Joseph Catholic Elementary School, K-8, and Pomona Catholic High School. The School of Arts and Enterprise is a charter high school located on Monterey Ave. and Garey Ave. Village Academy High School is also located on E. Holt Blvd and East End Ave. It is a high school that focuses on technology. 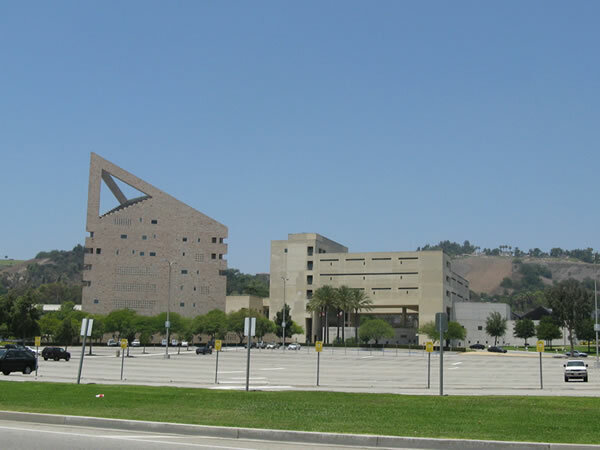 California State Polytechnic University, Pomona (Cal Poly Pomona) is located southwest of the junction of the 10 and 57 freeways. The university was established on the site of breakfast cereal magnate W.K. Kellogg’s ranch located on the city’s western corner. The majority of the campus is not incorporated within the city. The university has over 21,000 students and covers an area of over 1,437 acres (5.82 km2), which makes it the second largest land-holding university in the California State University system. The university is known for its engineering and architectural programs which are very selective and nationally ranked. Western University of Health Sciences, (formerly known as College of Osteopathic Medicine of the Pacific) is located south of Highway 10 off Towne Avenue. It is one of the largest health sciences universities in California, offering degrees in Osteopathic Medicine, Veterinary Medicine, Physical Therapy, Physician Assistant, Pharmacy, Nurse Practitioning, and as of 2010, Dentistry, Optometry, and Podiatry. WesternU’s new Patient Care Center opened in May 2010, and serves more than 10,000 patients per year. Pomona College was founded in Pomona in 1887, but moved to neighboring Claremont, California in 1889. Mt. San Antonio College, though administratively located in Walnut, California, is positioned directly adjacent to Cal Poly Pomona just west of Pomona and the 57 Freeway. DeVry University a publicly held, for-profit higher education organization part of DeVry, Inc.
All information about Pomona courtesy of Wikipedia.